The aim of WP 4 was to reach a broad base of farmers and other end-users in each country to raise their awareness, increase knowledge and help build confidence relating to the effects of slurry acidification technologies (SATs). WP 4 organized field trials for testing the use of acidified slurry against non-treated slurry. Aside from supporting the aims of WP 4, the results from the field trials were delivered to WP 5 for the purpose of evaluating the environmental and economic implications of SAT use. WP 4 acted as a link between the pilot installations and farmers, and was one of the most critical aspects of the project in terms of building farmer confidence in SATs. Open field days and field walks were therefore organized in each partnering country. The events focused on spreading knowledge about the results of the field trials. Target groups were farmers and other end-users, advisors, relevant NGOs as well as public authorities and policy-makers. 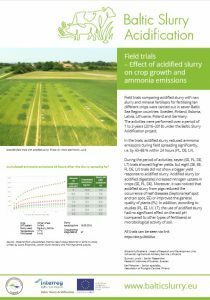 Field trials comparing acidified slurry with raw slurry or mineral fertilisers for fertilising ten different crops were carried out in seven Baltic Sea Region countries – Sweden, Finland, Estonia, Latvia, Lithuania, Poland and Germany. The activities were performed over a period of 1 to 3 years (2016–2018). The parameters for the evaluation of the field trials with acidified slurry were ammonia emission, crop yield (dry matter, protein content), plant health, soil pH, soil microflora and leaching. The trials were carried out on two different levels: scientific and as demonstration. The trials concluded that acidification significantly reduces ammonia emissions during field spreading of slurry, i.e. with 40–88 % within 24 hours. The yield response was not consistent, whereas the climate conditions for most trials were atypical. 2018 was dominated by heavy drought and high temperatures, with availability of water, rather than the availability of plant nutrients, being more limiting for crop yields. Seven trials showed higher yields, and eight trials showed low impact on the yields. Acidified slurry (or acidified digestate) increased nitrogen uptake in crops. Moreover, it was noticed that acidified slurry from pigs reduced the occurrence of leaf diseases or improved the general quality of plants. In addition, the one-year use of acidified slurry had no significant effect on the potential of carbonate soil acidification (compared to other types of fertilizers) or microbiological activity of the soil. Some of the conclusion are also presented in poster form. Read the whole report below or download it from the reports page.